On November 26th, 6 tenth and eleventh grade studentsfrom the international department competed in the finals of the speechcompetition. The goals ofthe competition were to improve english levels among the students, train theirspeaking ability, and help them develop their passions for studying English.All of the contestants prepared thoroughly and fully participated in thecontest. The contestants showed a clear improvement over past participants. Manny of thecontestants left their spectators with a deep impression. 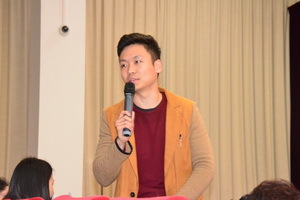 Zhang Tianrun, fromclass 10-B1, impressed judges and spectators alike with his oral fluency andfull examination of the topic at hand. He finally won first prize. 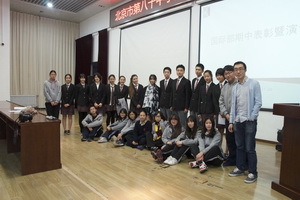 Zhao Anqi,from class 10-A2, and Chen Jing, from class 11-BI, earned second place for theirimpressive performances. 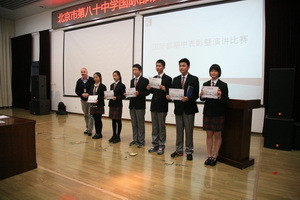 Zhang Junyi, Deng Wenwen, and Qu Zhi, all from Class10-A1, shared third place. Through their preparations, all the competitorsreceived invaluable practice and learned more about their strong and weakpoints in English. This lay a strong foundation for further study. 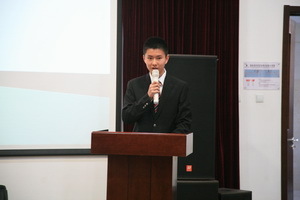 At the end ofthe competition, Xu Lei gave feedback to the participants. 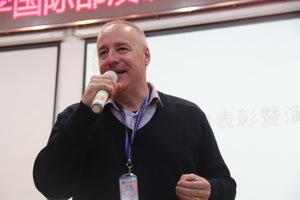 Speaking frompersonal experience, he critiqued the pronunciation and poise of each student.After this, Vice Principal Jordan gave a speech encouraging each student tokeep studying in order to improve themselves past what they had shown in thecompetition. 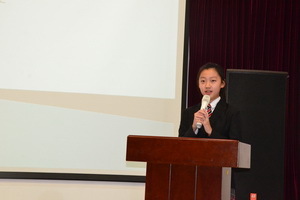 The two speeches gave the students a more thorough understandingof how they had done in the contest and where they still needed to improve. 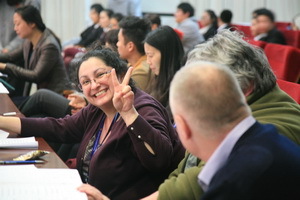 Good speakingability is important not only for admission to oversees universities, but alsois a an essential part of a student's personal development. The success of thiscontest is thanks to the effort of the Study Department of the Student Union,as well as all of the participants and judges. Hopefully the Student Union willbe able to hold more inspiring activities in the future.